Seating for 6/7 including a lounger, the shell is Soft Touch Slip Resistant Fortiflex™ HDPE and the cabinet is zero maintenance Vikashield™. 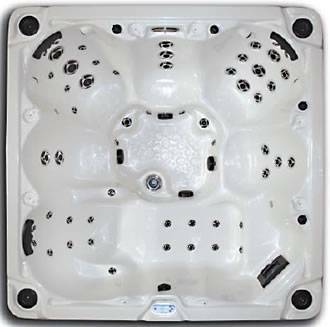 The spa has 61 stainless steel jets with storm jet technology, LED perimeter lighting, waterfall feature, 2 Waterways pumps and optional Jensen Bluetooth MP3 Stereo System. 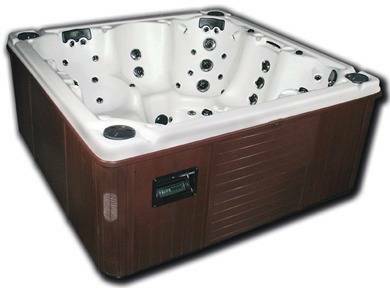 The Heritage Hot Tub features 61 total jets. The engineers spared no expense in putting in this spa all of the designed comfort and luxury they could think of. A lounger with 18 jets complete with hand and foot massage sooth the body and heal the mind. This 2 pump Goliath also features a diverter that activates all of the floor jetting to get the ultimate foot massage. The shimmering jet in the floor in the picture is our Volcano jet. This name definitely is accurate for what you will see when you turn it on. 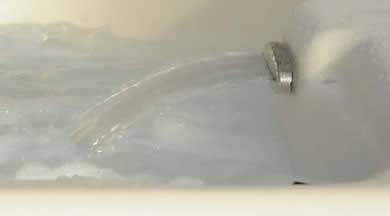 All Viking Spas use the industry’s finest components with uncompromising production methods and quality control standards. Complete with our patented indirect L.E.D lighting, L.E.D. cup holders & waterfall. This spa is the ultimate for anyone desiring the best. Add a Soft Touch shell at no additional cost to improve your hydrotherapy sessions!